builders, they are supposed to be the God of the human being who cure patients and give them the lease of life”. He further said that doctors should not run after money as service to the mankind must be their first priority. Mr Kovind said that doctors should treat the patients first out of humanity and not for money. treatment. “If a patient is suffering from critical disease, battling for his life and he/she is survived by the grace of doctor’s effort, then it must be the greatest satisfaction for the doctors than that of what the same patients will feel ”, he said. building is not only an excellent but also a monument”. And it should be the responsibility of the doctors fraternity to maintain its magnificence in future as well. 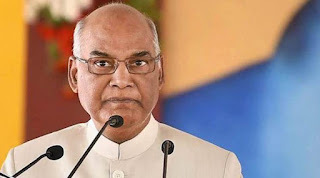 The President said that world’s largest gathering Kumbh is scheduled to be held next year in which over 15 crore devotees and pilgrim would turn up from across the globe. And it must be the responsibility of the Allahabad Medical Association that they should provide better medical facility so that every individual should be protected carefully. Doctors must have to work under the policy of ‘Prevention is better than cure’ so that not a single devotee return with any ailment. They must get the benefits of all the health-related schemes being run by both the State and Centre government. He further said that Mahakumbh festival is held in every 12 years while the Ardh Kumbh or Kumbh is held in every six years but the annually Magh Mela is held every years so it should be duty of the AMA as well to provide service to the devotees coming from all section of society even those who run on foot carrying bundle on their shoulders. It is only because of the confluence of the Ganga, Yamuna and mythical Saraswati, that a sea of devotees is seen on the occasion of such festival, he added. Allahabad Medical Association will have to become a partner in terms of providing the medical services to the devotees so that the name of the association could also be glorified in all over the country, he said with a smile on his face. While sighing off, the president of the India said that doctors should first treat the patients and not see the money as service towards humankind must be their paramount priority.